GARDENA, CA--(Marketwired - December 12, 2016) - Polar Power, Inc. (NASDAQ: POLA), a global provider of prime and backup DC power solutions, has closed its previously announced initial public offering of 2,400,000 shares of its common stock at a public offering price of $7.00 per share. In connection with the initial public offering, the underwriters exercised their over-allotment option to purchase an additional 360,000 shares at the initial public offering price, less the underwriting discount, in full. As a result, the total initial public offering size was 2,760,000 shares, and the gross proceeds from the initial public offering were approximately $19.3 million, before deducting underwriting discounts and estimated offering expenses. 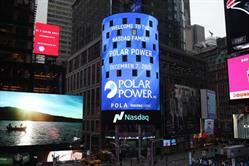 Polar Power's shares began trading on the NASDAQ Capital Market under the ticker symbol "POLA" on December 7, 2016. Roth Capital Partners and Joseph Gunnar & Co., LLC acted as joint book-running managers for the offering. Feltl and Company acted as co-manager for the offering. A registration statement relating to these securities was declared effective by the U.S. Securities and Exchange Commission. This press release shall not constitute an offer to sell or the solicitation of an offer to buy nor shall there be any sale of these securities in any state or jurisdiction in which such offer, solicitation or sale would be unlawful prior to registration or qualification under the securities laws of any such state or jurisdiction. The offering was made only by means of a prospectus. A copy of the final prospectus relating to this offering was filed with the SEC and may also be obtained from Roth Capital Partners, LLC, 888 San Clemente, Newport Beach, California 92660, Attn: Equity Capital Markets, via telephone at (800) 678-9147 or via email at rothecm@roth.com or from Joseph Gunnar & Co, LLC, Prospectus Department, 30 Broad Street, 11th Floor, New York, NY 10004, telephone 212-440-9600, email: prospectus@jgunnar.com. Gardena, California-based Polar Power, Inc. (NASDAQ: POLA), designs, manufactures and sells direct current, or DC, power systems for applications primarily in the telecommunications market and, to a lesser extent, in other markets, including military, electric vehicle charging, cogeneration, distributed power and uninterruptable power supply. Within the telecommunications market, its systems provide reliable and low-cost energy for applications that do not have access to the utility grid or have critical power needs and cannot be without power in the event of utility grid failure. Within this market, Polar Power offers three configurations of its DC power systems, with output power ranging from 5 kW to 20 kW and with three possible sources of fuel: diesel, natural gas and liquid petroleum gas. For more information, please visit www.polarpower.com.